There is not enough time in the day. I would love it if my child could start to dress herself but it just takes so much longer when I try this and I end up having to finish dressing her because I usually have a schedule to keep to. How can I incorporate helping her to become independent into the time constraints put on us by my busy schedule? 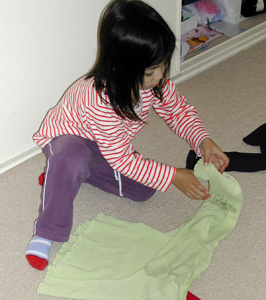 You are right: it does take much longer to help your child to dress herself than to do it yourself and sometimes there does not seem to be enough time . You have two options, you can start earlier or do it yourself. The second option means that you will get a quick solution in the short term, but as your child grows and develops and her desire to do things for herself starts to emerge, dressing can become a source of conflict, which slows you down anyway. The best advice, if you really can't start earlier, is to choose some times and occasions when you do have enough time to show your child how to do something simple. Show her very clearly, perhaps repeating one small step a few times and then let her try one step for herself. Gradually encourage her to do a few steps by herself. Before you know it she will be attempting to do it all by herself. If she is very tired she will not want to try and on those occasions it is important to do it for her. Little by little she will learn and enjoy dressing herself. A word of caution, don't overly praise any single action or lose patience when she doesn't want to try. When time is short, explain to your child that you are going to help today because you need to be somewhere by a certain time. How do I make sure that everyone takes the same approach? I have spent a lot of time trying to show my son how to dress himself and for a while he was making good progress and seemed genuinely delighted when he could put his shoes on for himself. Now I am back at work, the person who looks after him does everything for him and now he has started to refuse to do anything for himself. When I suggest that he put on his shoes because we are going out, he just puts his foot up in my face and says ‘mummy do it’. How should I respond? This is why it is so important for everyone to take a consistent approach with young children. You certainly don't want to seem like the terrible person who doesn't do anything for him but as long as someone else in his life is doing everything for him you will always be putting yourself in this position. Perhaps you could choose small tasks for you all to work on each week. For example, you could plan to see if your son could learn how to put on his socks, coat or jumper by the end of the week. Work out together the simple techniques you will both follow that will help him to learn how to do the task and discuss each day what worked and what didn't. I am not sure whether we are making progress or not. I have been following these simple steps to help my child learn how to dress herself and on some days she seems to do very well and can put on her shoes and coat for herself, and then other days she doesn't seem to be able to do anything at all for herself. Is she just attention seeking or is this normal? Children develop in fits and spurts and it is quite normal that on some days they don't seem to be able to do things they could do yesterday. Sometimes it might be because they are tired or perhaps they are just feeling in need of some attention. We all have days like this, even as adults, and it is perfectly appropriate for you to give your child some extra help when she seems to need it. If possible, try to take the approach of giving just enough help to get her over the particular challenge she may be having and then let her continue on. It is important that helping your child to become independent remains a positive experience for you both and does not become a battleground. My child does not make the choices of clothes I would like her to make. My child really enjoys choosing her own clothes and on the whole it makes getting up and out in the morning less stressful. Sometimes she wants to wear something that is not appropriate for whatever we are going to do. For example, she wants to wear her best dress when we are going to the park or a summer dress when it is freezing outside. What should I do about this? I try to suggest the pieces of clothing that she can choose between, but sometimes she becomes fixated on something else. It doesn't seem right to let her make all of these decisions for herself. This is a good example where preparation is the key to success. You have to make sure that what is in the cupboard is appropriate and then no matter what choice she makes you will feel happy with it. Put the party dress away somewhere else and only bring it out when it is an appropriate choice. Put the summer dresses away when there is snow outside and then she can choose what she wants. Of course, you may still find that her colour combinations are not what you would choose but you will have to put up with that!